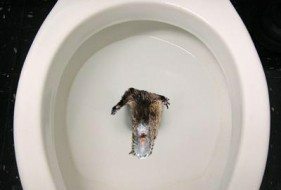 Seattle Sewer Rats in Toilets! Unfortunately, this is no urban legend. Here’s a fascinating (and horrifying!) video from the Seattle Channel (public access television) about the explosion in Seattle’s rat population this year. Dave also mentions that older sewer systems with deteriorated pipes and fittings often have small holes in pipes that offer an easy entrance for vermin. When you are doing home repairs on your plumbing, Dave recommends extra vigilance in reassembling the system, making sure every hole is plugged. If possible, he suggests using a professional plumbing service since they will have the expertise, equipment, and supplies to effectively finish the job. Yes we have much more coming!